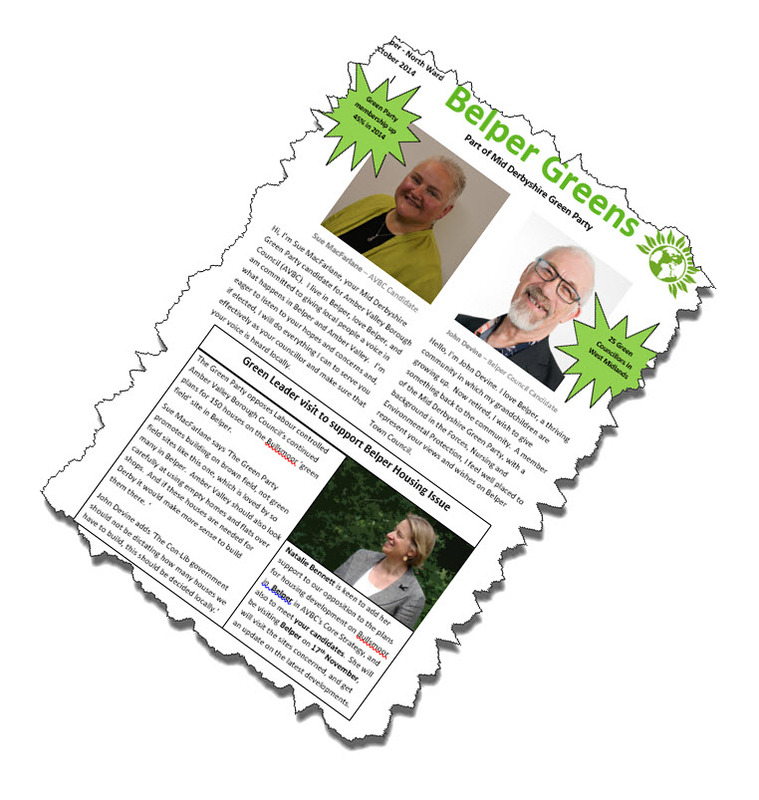 October newsletter shows Belper Greens mean business! The ‎Mid Derbyshire ‪Green Party clearly mean business! Their October newsletter has been delivered to every house in the town’s North Ward!! Bring on the elections! So what makes The Greens different? Every citizen will receive the ‘Citizen’s Income’ – no matter what! Most importantly, we will do what is needed to ensure our kids have a planet to inherit! New Belper Green Party Candidates selected! At a recent meeting of Mid Derbyshire Green Party, Sue MacFarlane was voted as lead candidate for Belper North Ward in next year’s Amber Valley Borough Council elections. At the same meeting, John Devine was voted as lead candidate for Belper North for the Belper Town Council elections. Mid Derbyshire Green Party will be fielding candidates in all four Belper wards next year, and Derbyshire Green Party is currently in the process of selecting candidates for the General Election. Given the record Green Party membership levels, recent defections of Lib Dem councillors to Greens, and the Greens showing ahead of the Liberal Democrats in recent polls, Mid Derbyshire Greens feel that the time is right to field candidates in local and national elections in 2015. Natalie Bennett, leader of The Green Party of England and Wales is visiting Belper on 17th November to meet the candidates, visit the greenfield sites that are still within Amber Valley’s proposed Core Plan, and to attend a public meeting where she will talk about Green Party policies and progress ahead of next year’s elections.